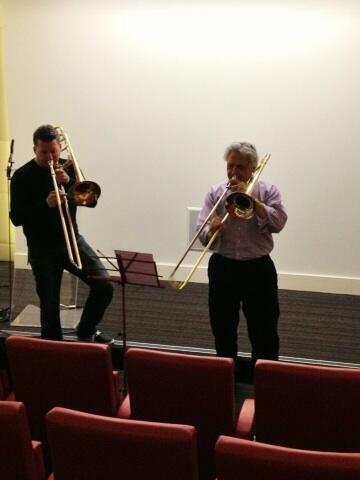 Here’s Simon Cowen putting Classic fm presenter John Suchet through his paces again. John is joining the RLPO for the annual Superorchestra day on June 15th at Liverpool Philharmonic Hall. Principal trombone, Simon, has been helping John blow the cobwebs from his instrument after a lay off getting on for half a century! This entry was posted in The Brass Section and tagged "Royal Liverpool Philharmonic Orchestra", 'RLPO', Classic fm, John Suchet, Simon Cowen, Superorchestra, Trombone. Bookmark the permalink. 1 Response to They’re at it again!